Dressing Your Dog For Halloween: Seven Tips | Will My Dog Hate Me? Last Thursday’s Dogs in International Costumes post spurred my pal Hilary Lane of Fang Shui Canines to remind me that people need to use caution when dressing their dogs. She’s absolutely right. I promised, and will herewith deliver, some advice on the proper methods of canine attiring for Halloween. 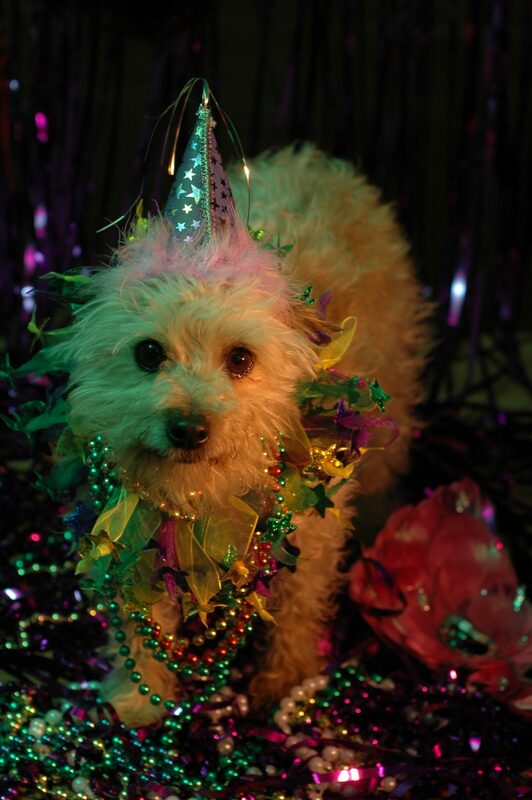 Nix the buttons, beads, sequins, loosely sewn ribbons…anything your dog can easily consume. That it’s not too tight; make sure it doesn’t pull or tug anywhere. That the fabric is soft and not irritating. No scratchy tutus, in other words. That it doesn’t impede your dog’s vision or ability to walk. That it’s made of a light, breathable fabric so your dog doesn’t overheat. Approach dressing your dog as you would any other training experience. Break it down into smaller stages — one paw in a sleeve, treat, treat — and be calm so as not to stress out your dog. Use the pantyhose technique — if you are male, have a female explain it to you — if you need to put an item over your dog’s head: Scrunch up the fabric so there is only a large opening and pull the item over his head, treat, then find the individual leg holes and put the paws in, treat treat. Do something fun with your dog afterward, though you should probably avoid walks where it will be possible for your dog to try to “re-scent” the costume, contributing his own dead rodent aroma addition to the Halloween experience. It is authentic to the holiday but you and your dog will never be invited back to any parties. Even if a costume seems comfortable, many dogs aren’t accustomed to clothing and may get caught on something or end up in an otherwise dangerous situation in an attempt to undress themselves. Let’s face it. Most people dress their dogs up for Halloween for the photo op. Once the picture is snapped and posted on Facebook, those dogs are out of those outfits. I know that you were thinking that the picture of Frankie that is posted here breaks every rule of dog costuming. That’s because Amy Haskell, the talented photographer who shot it, snapped about 90 images in 60 seconds and then relieved Frankie of modeling duty, removing beads and baubles. Incidentally, this is Frankie’s most famous picture (though he has not let it get to his head). Amy sold the image to Borealis Press who used it for a greeting card (#489 HB), refrigerator magnet, and cocktail napkins. It can lead to some serious fashion faux paws. If your dog firmly resists being costumed, do not persist in your attempts. Getting your dog upset can make for a really scary Halloween — and not in a good way. Note: I am devoting my usual pet travel Thursday space to a different topic as a public service announcement in time for Halloween. But I’ll be back with pet travel next week, and two weeks from today, on November 10, the first meeting of the pet book travel club will convene. So get your copy of Travels with Charley by John Steinbeck and start reading if you haven’t already! Not everyone dresses their dog just for the snap shot. I see them in the mobs of people who head to my street (the most popular Halloween destination in town). The rule I’d add is the same for children–make sure your little one (canine or human) doesn’t get hurt trying to walk in a costume that’s hard to walk in. It’s true, I don’t have data about how many people keep their dogs dressed for an extended period of time; I was just thinking that the hats and other cute accoutrements you see in many of the pictures wouldn’t stay on for long. My street — a major road — is neither kid or dog friendly. What makes your street Halloween central? My fabulous neighbor up the street is a broadway show designer wanna be. He decorates for every holiday but really goes to town for Halloween. We get drive-by spectators all month long. And a few doors up from him, the local dentist’s office sponsors a haunted house. We get so many kids we don’t even have time to look at their costumes. I’ve started coping by having a party where the price of admission is a bag of candy and guests can take shifts on the front porch. I’m liking Two Pitties in the City’s take on minimal clothing which seems to make their dogs more approachable. Minimal is about all my hounds will tolerate. And yes, watch your dog – Choe Beagle was wearing a harness which got caught on the chain link when she tried to go over (yep, one talented little Beagle). She was supervised and is now sans harness except during walks. She maintains she just wanted to say good-bye to our friend, Andrew :). Late to checking out the link you sent, but I love those hoodies! Those pitties look very cute. I would augment #7. If you dog is not tail-wagging happy about being dressed up, get the costume off of your dog gently and ASAP. 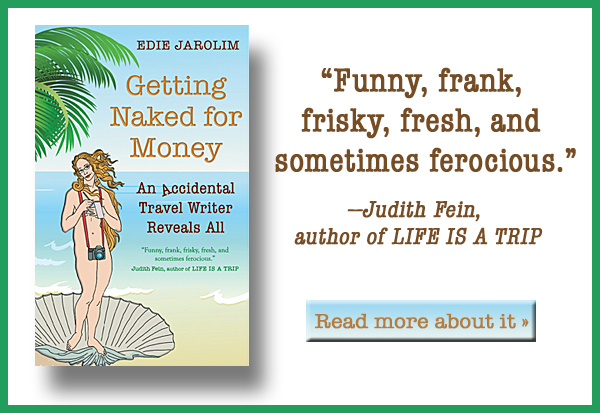 Thanks for writing this, Edie. I’m always worried when I see costumes for dogs and how people make their dogs wear them when the dogs clearly don’t want to. But for those dogs who tolerate it, these tips offer a lot of good advice! I agree with Lorie that I wouldn’t have thought about drinking and dressing, either! Great tips (as always)! I was very glad to see you went out of your way to explain how you got the glitzy photo of Frankie, too. Thank you, Irith; I’m glad you noticed that instructional value of the Frankie photo! And it’s very nice to see you here. Hope all is well with you. Well, we never win any costume contests because 1) We don’t subject our dogs to elaborate, uncomfortable garb they hate and 2) We don’t really dress them up 🙂 If we had kids to take trick-or-treating you bet we would dress them up and take them around the neighborhood though. Hey, I wonder how my neighbors would feel if I dressed up my fur “kids” and paraded them around the neighborhood pilfering their candy? Ha, ha. Good safety tips for folks. Thanks. Stopping by from the blog hop. Happy Tails and Trails! Hmmm. You’ve made me wonder if there are kids who get dressed up because their parents want them to, but are as reluctant as some dogs. Nice post. I hope you get a lot of traffic. Thanks for coming by — and, via CommentLuv — for introducing me to the Flo Zone. Fun blog! Thank-you for your list. We don’t celebrate Halloween in Australia, but I’m going to make sure to share this with my Twitter followers. I didn’t realize that Halloween isn’t celebrated in Australia! Thanks for coming by and thanks for sharing this with your Tweeps. Just stopping by from the blog hops…These are sound tips. I especially agree with tip#7 in respect to my pets. Vanilla Bean, my ShihPoo puppy tolerates dresses and hair clips but she dislike to dog booties and hats. I think very few dogs tolerate head gear; Frankie looks fetching in his cowboy hat, but I can only get him to keep it on for a half a minute. He’s fine with shirts and other full-body items but I’ve never tried booties on him. Good rules! I’m not big on dressing up the dogs, but some costumes are absolutely perfect on them!! This is on point! I don’t judge people because some dogs love to dress up and it’s no problem. Some dogs (like me) HATE it and shouldn’t be dressed up. As long as the owner is responsible what’s the harm? But if you’re doing it to get a little attention for yourself at your dog’s expense? That’s NOT what I call responsible. Great advice. I’m seen some poor pups with costumes that overwhelm. The dog looks like he/she is very uncomfortable having to cart around this heavy cardboard or fabric thing. What a great blog! I’ve often wondered about the dogs that are dressed up as mine simply refuse anything on their bodies! I have had to be very patient even with their harnesses and leash. They finally decided that they would get to walk so no more arguments. I must admit I’ve seen some very cute costumes. I’m going to share….Thank you! I love the advice about a paw in a sleeve then a treat. Great advice. Much less stressful for the dog too. It’s funny, but having bigger dogs, I have never really been tempted to dress them up. But, I think I would have to go for the photo op if I had a smaller dog. Good thing I don’t. Poor thing! God knows what kind of costume I would choose! Ha, I’m sure any costume you chose would be very tasteful! This year I dressed my horse Kadence up as a dog so I REALLY wanted to dress my dog up as a horse and take her with us. But I didn’t…I thought it would be too much for me to responsibly take care of…especially since my horse costume involved no halter for my horse! Target had a super cute jockey costume that I was planning to use for this.